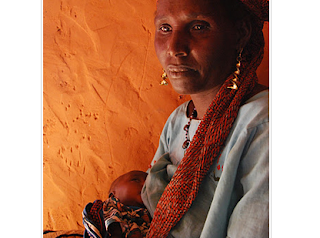 Dije Ousmana, 45 years old, breastfeeding her two-month-old baby Abdulahadi. Yan Sara village, Dakoro, Niger. In her arms, baby Abdulahadi stirs, opens his eyes, and begins to cry. Dije quietly puts him to her breast, but it isn't long before the cry turns into a wail. Outside, her daughter continues to pound millet for the family's only meal of the day. Dije's six-year-old son runs in and asks when the food will be ready. this story makes me too sad - thank you for posting, I am donating to this organization now.